Beautifully decorated cut-out cookies for every celebration and holiday are totally attainable at home with this easy royal icing recipe for sugar cookies and a few tips & tricks to give you the confidence you need to try this technique yourself! In a large bowl of a stand mixer, whisk together the meringue powder and powdered sugar, then slowly mix in the water and vanilla while the mixer is running on medium-low speed. Increase speed to medium and beat until stiff peaks form, around 7-10 minutes. This can be done with a hand mixer, but will take a couple minutes longer. Divide the thick white icing into individual bowls for how ever many colors you want and add gel food coloring, a few drops at a time, mixing well until you achieve the shades you like. 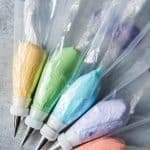 From there, you can reserve half of each color at piping consistency for piping borders as described in the post, or thin all the icing to flood consistency. To thin each color to flood consistency, add 1 teaspoon of water at a time and stir well, continuing to add water by 1/2 teaspoon increments until you reach your desired consistency. Once your icing is colored and the right consistency, scoop it into a piping bag fitted with a size 2 or 3 tip. Decorate your sugar cookies by first outlining the border, then filling in the middle with flood icing which should settle into itself. Use a toothpick or scribe tool to fill in any gaps by spreading the icing around, then tap the cookie on the counter a few times to help the icing settle into a smooth, even layer. Dry cookies at room temperature for 6-8 hours until the royal icing is completely firm before adding additional layers or design or stacking for transport. Be sure all bowls and utensils are totally grease-free or your icing will never reach the consistency you are going for.